Three Deluxe 3 CD Media Book Editions. 12" mixes, non-album b-sides, previously unreleased demos and rehearsals, BBC Radio 1 sessions and live concerts, plus notes by Neil Arthur, photos and lyrics. Unfortunely Track 4-13: Don't Tell Me (Extended) is again the 12'' Version where the first verse is missing !!! The version with both 1st & 2nd verse is still unavailable on CD !!! Just a quick note to save anyone the comparison: the version of '22339' here is the original album version, not the (previously unreleased) longer version on Edsel's first reissue of 'Believe You Me.' Similarly, this set's 'Mixing on the Ceiling' is the original megamix from the 'Lose Your Love' 12", not the mis-titled previously unreleased unique remix of 'Living on the Ceiling' found on Edsel's 'Believe You Me' CD. You have the exclusive edition - the signed print can get stuck face down to the inside of the box and be overlooked easily. Empty the box and then check very carefully inside the box for a white card a few mm smaller than the box stuck to the inside. Most people do find their "missing" signed print. not times for the tracks? still don't know which versions are which. I just received my signed print / Amazon exclusive box ... but there's no signed print or "Amazon exclusive" mentioned anywhere on the sticker or box set at all?? Is that correct? Is the only difference the "BLANCBOX01X" on the front and the different barcode sticker on the back? 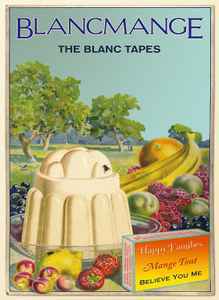 So... are the bonus tracks on this MP3-sourced again, just as they were on The Very Best Of Blancmange?